I absolutely love pasta. If I thought that my metabolism would let me get away with it I would probably eat pasta at every meal, everyday. You get the picture, it's delicious. My two boys share my love of pasta to an extent. They love spaghetti and meatballs, but often turn their noses up at pesto. So in order to please everyone I have to find recipes that have a lot of flavor, but also have a visible ingredient that my two boys like. Given that they are now three and six the foods that they like seems to change on a weekly basis. One day they love cheese, the next they tell me it's their least favorite food. The next day they love chicken, then they only eat hamburgers. As you can imagine it can become a little bit tiresome. Add to that that my husband is on a specialized diet and isn't eating any of the meals that I prepare, I have become a little kitchen crazy to say the least. So this week I decided to try a new recipe for Balsamic Roasted Sausage and Grapes with Linguine from the June/July of Taste of Home, which looked like it would have aspects that both my kids and I would enjoy. This recipe has 12 ingredients. It takes 15 minutes of prep and 30 minutes of baking and makes 8 servings. I did make a number of changes to this recipe. First I completely misread the recipe and ended up only buying 1 1/4 pounds of sweet Italian sausage. I can either blame it on getting older or the first week of school, but whatever the reason it happened. So instead of using 3/4 of a pound of both sweet and hot sausage, I just used 1 1/4 pounds of the sweet. Honestly, for my kids it was probably better this way. Second, I had bought over two pounds of grapes last weekend. I should have known that they wouldn't last until I made the recipe. I think by the time I made this dish I had approximately two cups left, so that is the amount that I used. Finally, instead of multigrain pasta I used regular. I would love to say that I enjoy the taste and texture of whole grain pasta, but that would be lying. I have tried every brand available and I still hate it! Since I changed so much of the recipe I reduced the amount of spring mix salad greens. My kids can be hit or miss with greens, so I reduced them to approximately 1 1/2 cups. I also let the spinach cook on the stove with the pasta for about a minute so it would wilt. I followed the remainder of the recipe as written. 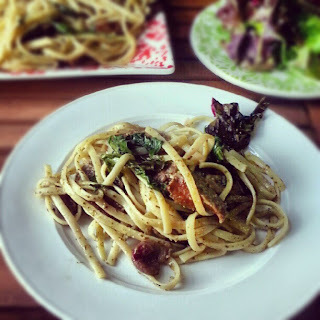 I really enjoyed the taste of the balsamic roasted sausage in this recipe. The vinegar gave a nice sweet taste to both the grapes and the sausage, without making them too sweet for a pasta recipe. I also like that there are two types of greens making the dish healthier. I bought prepared pesto, but this would be even more delicious with homemade. Homemade pesto would make this dish fantastic. Overall a very easy pasta recipe that has a nice flavor profile and is kid friendly. For the recipe go to Balsalmic Roasted Sausage and Grapes with Linguine. Thanks, plus it was easy! Your site is wonderful. I love food and I love West Virginia. Thanks for sharing with us. Thanks for the nice comments :) Come back again soon!